The only comment that may even allude to the fact that there is something to discover at the Barber Marina on their website (barbermarina.com) is the simple phrase, “Visit our marina and judge for yourself.” There is no “Dinosaur Hunt Adventure” ad or “Amazing Stonehenge Replica” mile marking ads leading up to the entrance itself. Honestly, you think you’re in the wrong place. You don’t own a boat. You don’t even own boat shoes. You're ready to turn the car around to save security the trouble of escorting you off the premises. But sure enough, the rumors prove themselves true. In between the evenly spaced pine trunks, just off to the right, is a giant tyrannosaurus rex creeping up on you, gnarly teeth and all. Keep driving towards the water and you’ll track down a stegosaurus, triceratops, and an adorably cheerful brontosaurus. Really, we couldn’t help but laugh. And Bamahenge? Stonehenge in Southern Alabama? But why? Oh, I’ll tell you (at least what I know). The billionaire that owns this Marina is the wonderfully quirky George Barber. As the story goes, his brother-in-law was driving through Virginia in the 90’s and came across Enchanted Castle Studios surrounded by the beautiful larger-than-life creations of Mark Cline. Kelly Kazek of AL.com tells us that the man pulled right up, jumped out of the truck and stated that he may know a guy interested in purchasing his “lawn ornaments.” Cline was not in love with this idea, so he asked a price for the dinosaurs that no sane person would possibly pay, and so began the wild partnership of Barber and Cline. The dinos were loaded up, hauled to Elberta, Alabama, and that was that… for the time being. A hurricane came through and damaged some of the creatures, so Barber sent for Cline to come repair them. The fiberglass slabs Mark Cline brought with him to patch his creations were humongous. Barber joked that they looked like the big rocks at Stonehenge. Cline Laughed. Barber didn’t. When George Barber wants a Bamahenge, George Barber gets a Bamahenge. 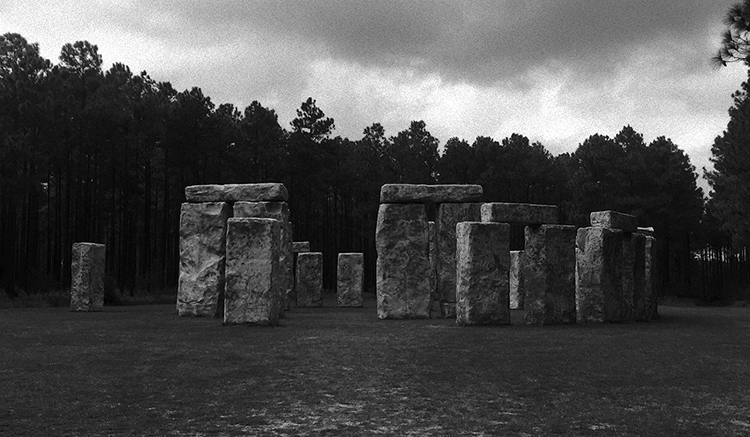 This stonehenge replica is actually amazing. The road is blocked so that no one drives their car in there, so everyone has to walk out to the site, which is the best part because you keep telling yourself that it must be pretty close, it already looks so big! you keep walking, it keeps growing. Here’s our three foot tall baby for scale. George Barber also had a hankering for a fifty foot woman to hang out in his marina, so of course he called up his old friend, Mark Cline. I hear she is incredible, but we were told that she was damaged in some crazy thunderstorms a few weeks back, so she’s just chilling in the woods until repairs can be made (I assume by the wildly creative partner in crazy, Mark Cline) and she should be floating happily again in early spring. When we can check it out, you guys will be the first to know! Also, coming across a monstrous woman hiding among the pines would frighten me more than any t-rex, so it’s a good thing we couldn't find her. If you’re in the area, head east on highway 98 from highway 59. in about 8 miles, turn right on county road 95 and in a few miles just follow the signs for Barber Marina. You'll want to use google maps, but don’t. It sends you to Orange Beach. I love Orange Beach, but they don't have dinosaurs. If you guys have any local or southern stories you would like me to research, check out for myself, or just think I would really enjoy, please comment below or email me at serpentwithamission@gmail.com. I can’t wait to hear from you!